Thank you for stopping by AsYouWishCreations4u! I create printable party invitations for baby showers, birthday parties, bridal showers and more. 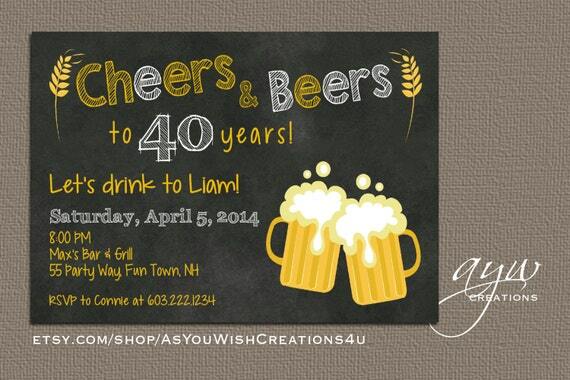 Wow your birthday party guests with these personalized birthday party invitations. These invitations can be customized to your color and text preferences. With or without a photo included, your birthday invites will be made as you wish. This listing is for a personalized digital file (in your choice of 4x6 or 5x7 - if you require a different size, just ask) of the pictured invitation in the first photo position. To order a design in one of the other photo positions, please make note of that with your order. You will be able to have the invitations printed at the place of your choice. Matching party decor can be purchased for any of my invitations. Matching items are fully customizable with any text you’d like. Please view the 2ND LISTING IMAGE for the list of matching decor options that are included as options. If you want something that you do not see listed, please ask. There may be an added fee for some items that are not on this list. To order matching decor: Please choose the “Invitation +” option in the Purchasing Options drop-down menu that corresponds to the number of matching decor items you want. During checkout, in the “Personalization Box” or “Notes to Seller” section, please include a list of which matching items you want. 8.5x11" page with two invitations on the page - can be printed at home or at a professional printer (Staples and FedEx copy centers can print on heavy cardstock). When purchasing, please send me the text details you need on the invitation and any color edits needed in the “Notes to Seller" section during checkout. You can also send the details to me through a message/convo here on Etsy. Send photo(s) to me through Etsy messages. A proof will be emailed to you within 3 days (but is typically done within 24 hours) once I have all the information needed from you. I will work with you on any edits/changes you want until you are happy with the final product. Once you approve the proof, I will email the final file to you within 24 hours (again, usually will be done much sooner). - ♥ - ♥ - ♥ - NOTE: YOU ARE PURCHASING A PERSONALIZED ELECTRONIC FILE THAT WILL BE EMAILED TO YOU. NO PHYSICAL PRODUCTS WILL BE MAILED TO YOU. THIS FILE IS FOR YOUR PERSONAL USE ONLY - SHARING FILES IS NOT PERMITTED. - ♥ - ♥ - ♥ - IMPORTANT NOTE: The invitation may print slightly different than the color you see on your device's screen. Given the color variation possibility, I recommend you print just one of the final file to check colors before having them all printed. If the colors are not quite right (which does not happen very often) I will tweak colors for you at no additional cost. If you don't see what you want, or want to make color or design edits to an existing design please message me. I am happy to make reasonable changes at no additional cost! Please see my FAQ's section if you have any questions. Still have questions? Feel free to message me. Beer clipart courtesy of Jessica Weible Illustrations, Inc.